You’re probably going to spend some time thinking about which trolling motor to purchase. It’s a tough decision. You need precision boat control without excess noise and hopefully at a price you can afford. After deciding on what rod, reel, and boat you are going to use, a trolling motor is one of the most important gear buying decisions you will make. What do you even look for? Fortunately, the best trolling motor for you doesn’t have to cost a fortune. The Minn Kota Endura C2 isn’t just affordable, it has a legendary reputation among anglers. The Endura is the only trolling motor that a fishermen will ever need. It’s a staple product that other builders try to copy. Minn Kota does it the best. The Endura C2 represents the latest in Minn Kota’s long history of trolling motor innovation and development. They are dedicated to providing the silent, energy efficient electric motors that rival the most expensive models on the market. The Endura C2 model we linked to above is the 15 pound trust version with a 30″ shaft length. For a boat under 16 feet, the Minn Kota Endura 30 will provide all the thrust you will need. You can find trolling motors today that produce almost 200 pounds of thrust. However it’s unlikely that you need that much. If you’re looking for the best motor that is still affordable then you’re best suited with something in the 18-50 pound thrust range. You’ll need more thrust if you have a large boat and you are fishing in a big body of water. As a rule, you will need 5 pounds of thrust for every 200lbs of weight you need to move. This includes the contents of your boat. You don’t have to stick to this rule completely. Keep in mind that just a few years ago you couldn’t find a trolling motor with more than 18 pounds of thrust. If you really need to, you can use an under-powered motor. However, it usually doesn’t cost much more for a motor with additional thrust output. Telescoping Handle: The 6-inch telescoping handle steers easily and is comfortable. Power Prop: Minn Kota designed the prop for a quiet operation and superior effectiveness while pushing through heavy vegetation. Level Lock Bracket: Stronger than most conventional brackets, the locking bracket is molded from composite materials that resist damage from the sun, flexing, and warping. 5-Speeds: Forward, reverse and multiple speed settings. Composite Shaft: The shaft is indestructible. It’s stronger than steel and Minn Kota guarantees it for life. 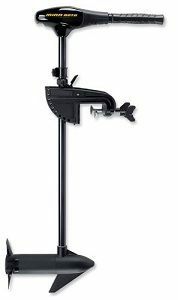 “Cool, Quiet Power”: Minn Kota claims that their trolling motors run smoother and with less noise than anything else on the market, regardless of price. The result of their efficient design is improved battery life and durability. Attaching the Minn Kota Endura C2 to any boat is fast and easy. The mounting bracket is a simple composite design that’s more durable than most of the other mounts we’ve seen. The smallest model is perfect for small boats, it will move a 14 foot tri-hull around at a few knots. The Endura C2 30 works especially well on a flat stern canoe. With a lightweight boat you can really develop speed with this motor. Operation is straight-forward and simple. The handle twists for speed. There are three reverse speeds and five forward speeds. The entire handle and speed mechanism is retractable. You can move it forward or backwards to get a better position in the boat. The Endura is light and well balanced on the mount. It only takes a minor amount of pressure to tilt the motor and bring it out of the water. Trolling with the Endura is efficient and silent. The prop turns effortlessly even through the thickest tangles of vegetation. Even on the highest speed settings, the motor stayed quiet. When used with a canoe, speeds can reach 2-3 knots depending on cargo weight. Silence is the key to effective trolling motor operation. In operation, the Minn Kota Endura C2 is one of the quietest, yet strongest motors we’ve seen in operation. The “Cool, Quiet Power” design definitely lives up to its name. Though years of development, Minn Kota has created the technology to create a perfectly quiet motor. An additional advantage to the motor’s efficient operation is lower energy expenditure. Compared to other battery powered motors, the Minn Kota will run longer while producing similar levels of thrust. Minn Kota’s Endura C2 is the top model you can buy for a small boat. If you have a larger boat, it’s highly likely that you already have a trolling motor or know about more expensive and powerful options. For smaller boats, like square stern canoes and tri-hulls, the Endura is a perfect choice. If you are looking for the maneuverability advantage of a bow mount motor, then this isn’t it. The Endura only works as a transom mount. The advantage is that it is perfect for trolling purposes that bow mount motors can’t match. Many fishermen think that bow mount motors produce less noise. These anglers obviously have not experienced the Minn Kota Endura. It’s just as quiet as many of the bow mount motors we’ve seen. It’s hard to be disappointed with any motor in the Minn Kota lineup. They are the leaders in transom mount trolling motor technology for good reason. The Endura is an advanced, full-featured, versatile and affordable option and certainly the best trolling motor we’ve seen for the money. Sometimes, you don’t need to break the bank to get the best quality fishing gear available.